As with most things, a little change can be a great thing. … so I decided to kick it up a notch! This is the new version of my site. There’s a lot of angles, colors, and various insights to my life that aren’t work related. Eventually I want to do a lot more, but I know that the best things in life are built a bit at a time… Rome wasn’t built in a day, after all! Everything is built with CSS and Flexbox. I debated using Grid, but I knew I could get Flexbox to behave – especially with the vertical timeline in the middle of the page. I still need to add my portfolio, but I feel like this is a much more vibrant representation of who I am. I’m not stuffy, business minded… I want to make the web a more beautiful place. The site also adds in a few of my other passions as well: specifically, gaming, ministry, and culture. I know this seems like a smorgasbord of topics, but they all come together to form who I am, and they (combined with my design and development work) are the lenses in which I view life. The backgrounds all scroll at the same rate, even those the images are different. The calendar is running a customized version of Modern Tribe’s “The Events Calendar”. I wanted something where I could have a nice way to look at upcoming stuff. Eventually, I’ll have streams (Twitch or YouTube) and other ‘short term’ items that aren’t just conferences. I have a few other ideas that will be coming soon. But I want to nail down what I have before I add on, and that’s nearly done! I’ve never felt so good about a design as I do about this one, and I feel like it’s… me. It’s a little rad, a little chaotic, and bright – just like I aspire to be in real life! I’ve been using Vagrant and VVV with VV (a site creation wizard) for a while now as the cornerstone of my development workflow. I have customized my VVV quite a bit over the years, and – while I was happy with it – I was always on the lookout for something better to see if it would fit my development workflow better. On a whim, I decided to check out a new app on a recommendation from a co-worker: Local by Flywheel. Flywheel is a fantastic WordPress host, and I’ve had the chance to meet a few of their reps at the last WordCamp – they’ve got a great service, and to see them focusing on the entire development process (from local development to the final production site) is refreshing. Installation of Local is easy: simply visit https://local.getflywheel.com/ and click on the obvious “Free Download” button. It’ll ask for a few pieces of information, and whether or not you want to use the Mac OSX version (stable) or a beta version of their Windows client. Run through the install process and run the program. It’ll set up the initial run-through and will set a few variables and settings on your machine. Once you’ve installed the software, you’ll be taken to the home screen, where the fun really begins. The screen has two tabs at the top (Sites and Settings). The Settings tab runs through the various options you can set up for your install. A lot of the options can be left at their default, but I want to go over a few of the important ones. I like to set the Admin Username, Admin Password, and Admin Email here – that will allow any new sites to be created to default to those values. The Default Sites Path is also good – I set mine to something in my home directory so I’d have quick access to it. I installed two add-ons at the time of this article: The “Pressmatic Stats”, and “Live Links”. I’ll assume you’ve installed them too, and will reference them later in this post. The left bar will contain any sites that you’ve installed. Right now, we don’t have any, so let’s create one – Click on the plus sign in the bottom left corner and click “Add New Site”. Enter a Site Name. The domain and path will auto-fill, but you can change those values as you need to. Under the Environment tab, you can customize your environment details. Personally, I like PHP 7.0.3+ and nginx as my server of choice, but that’s because it mimic’s my production environment. If your production environment is different, you can set the options to match. Under WordPress, you can set up a multisite, as well as customize the Admin Username/Password/Email you set up earlier. Click “Add Site”, and your computer -may- ask you for Administrator access. This is to auto update your hosts file so visiting the Site Domain (sitename.dev) will resolve correctly. Once your site is live, you can view it at the link you put in the Site Domain. Clicking on a created site in the left bar brings up the options panel. If the “light” next to the site is on, that means the site is active, and can’t be modified. Any sites that are off can have options modified upon their next activation. You can find all of the database credentials in the Database tab – as well as buttons that will automatically connect you via Sequel Pro or Adminer into the database – very useful if you’re migrating in a current site and want to drop the database in. One of my favorite features, small irregardless, is the ability to trust the SSL certificate to allow secure access to the site. Done via OpenSSL, it’s a nice feature if you want to test security features and/or integrations (API, eCommerce, etc) on a secure production-like environment. The Mailcatcher is super useful – it’ll catch any outgoing emails from WordPress and hold them – great for seeing outgoing eCommerce emails, or other WordPress notifications. The big thing here, however, is the Live Link. If you downloaded the appropriate add-on earlier, you can activate this button and get a link to your WordPress install that works outside of your local environment. Developing a site and want to demo progress without pushing to a staging server? Activate the live link and send them the URL. The More tab will also (if you installed the add-on) show you CPU and Memory usage via a handy-dandy scrolling graph. The Live Link alone was worth switching to Local from Vagrant / VVV. I know there’s methods to allow that functionality in Vagrant / VVV, but the sheer ease-of-use makes it a slam dunk for me. I’ve been using it for a few weeks now – to properly put it through its paces – and it’s so much faster than Vagrant. I don’t have to wait to have the Vagrant box re-provision itself. Local uses a docker container setup and it makes the whole process so much more speedy. So, if you’re like me and want a reliable, easy-to-use local environment, then head over to the Flywheel Site and download it! If you’ve used it, or have a question, hit the comments below! When it comes to developing a new site, every developer has a stash of favorite code snippets or reusable modules they keep handy. It could be a homemade widget, a section or module that is adaptable to multiple sites, or custom code that you use to personally extend the functionality of WordPress, but every developer worth their salt has them. But over and over again I keep hearing the same question from new and old developers alike: Should these snippets be put into the functions.php file, or stored in a plugin? If you’re not familiar with it, the functions.php file is a special template file that stores any theme specific code that runs only when your theme (or a child theme) is activated. Most times, pro themes will put all of their “on theme activation” codes, option panels, color pickers, and what-not in the functions.php file – or at least, in a file that’s included IN the functions.php file. Plugins, on the other hand, will run no matter what theme you have. You could change themes once a day for 30 days and still have the functionality of your plugin going strong. The way I see it, there’s a fairly standard rule of thumb to use when it comes to this sort of thing: if you have a bit of functionality that needs to run on any theme, then it should go in a plugin. If your functionality is theme specific and won’t transfer over to another theme, it should probably go into the theme’s functions.php file. The differences between these lists: The theme functions would stop working if the theme was switched, but you’d still have Google Analytics, all your custom post types / taxonomies, and any extensions. Agree? Disagree? Have any special practices or rules of thumb you use for your own development? Leave them in the comments below! Including files in a PHP environment can be tricky for new developers. There are no less than four ways to include a file: include, include_once, require, and require_once. Moreso, there’s very subtle differences in the reasons behind using each one. Throw in WordPress (which has its own specific flavor of include tag – get_template_part) and it can be downright confusing. Using the wrong one, especially in plugin development, can mean the difference between a working plugin and a fatal error. Let’s break down the various tags and shed some light on their usage. <?php include(); ?> – The include statement includes and evaluates the specified file. Simple enough. If you need to call in an external file, using include will bring all of the code into the script you’re running, at the exact spot you’ve placed the tag. This also means that the file gets access to all of the functions and variables you’ve previously written. It serves the same function as taking the file, copying its contents, and placing it in the same spot as the tag. <?php include_once(); ?> – The include_once statement includes and evaluates the specified file during the execution of the script. This is a behavior similar to the include statement, with the only difference being that if the code from a file has already been included, it will not be included again. As the name suggests, it will be included just once. Include_once is useful when you worry about variable reassignment or “double-calling” existing functions. Use it, and worry not about duplicate scripts being called. <?php require(); ?> – require is identical to include except upon failure it will also produce a fatal E_COMPILE_ERROR level error. In other words, it will halt the script whereasinclude only emits a warning (E_WARNING) which allows the script to continue. <?php require_once(); ?> – The require_once statement is identical to require except PHP will check if the file has already been included, and if so, not include (require) it again. It’s amazing how easy it is to break these commands down, and yet how subtle the differences are. If you require a file, and that file doesn’t exist, it’ll throw an error message and will halt the script where it stands. Include, on the other hand, will simply throw a warning message, allowing the script to continue running. This is a fairly standard usage. Get_template_part works well with WordPress because it’s a degrading include – it looks for the more specific template first, before (upon failure to locate) moving to a more general template. It starts with the file in a child theme folder, then in the parent theme, and finally checking for a more generic template (child theme first). So, what gets used when? Here’s a few very simple rules of thumb. Obviously, you will want to check your own needs before making a final decision, but this is more of a catch-all, quick thinking way to remember what to do. The larger your site, the more likely you’d rather use require_once than include_once. Smaller scripts can get away with include_once; the more moving parts there are, the more likely you want exact control of which files get called and where. Any time a file you need is in your WordPress theme folder, use get_template_part. Period. Variables, unless they are global, are un-accessible in templates called with get_template_part. If you need to access a variable, make it a global variable. When using require and include, never use absolute links. The second you deploy your site, things will start to go haywire. Instead, use relative links. If you want my honest opinion (and this is strictly that – an opinion) unless you’re doing some outside-of-WordPress stuff that needs to be brought in, most files that need to be brought in through WordPress should be done with get_template_part. If it’s outside of WordPress (calls to external databases or content), then you can use include_once or require_once. Any best practices I missed? Feel free to share them below! Thanks to Ben Woodard for the inspiration for today’s post! Overlay wireframe on Photoshop (onto 16 column grid). Code mockup into CSS/WordPress template. Seems relatively straight-forward, right? I’ve been seeing post after post online saying that “designing with Photoshop is dead” and “the bell tolls for Photoshop”. While the article titles are a bit on the apocalyptic side, they did get me thinking: is my workflow wrong? Am I working in an outdated method? This workflow works for me. I’ve got this down to a science. Clients end up with websites they are happy with, and I end up with products that I’m proud of (and am willing to put on my portfolio). Granted, there are pros and cons to both, but everyone has a workflow that they’re used to, that works for them, and that lets them do what they do best: design/develop/write. I’d love to know your workflow, if you’re in the business (or if not, hey that’s fine too). I feel like mine works for me, and it allows me to get stuff done in a timely fashion, and I think (ultimately) that’s what matters. Just a little inspiration for those of you who are out there “doing” it day to day. Don’t sweat the details. Just go out and do awesome stuff. If you develop WordPress themes, chances are that you fall into one of two camps. You may be the person who takes premium themes and customizes them to your client’s wishes. Or, you may be a custom builder who writes everything from scratch. Chances are you use a lot of the same code, functions, and themes in your endeavors, and may even have a core theme created with all of those little bits of code. Regardless of your method to the madness, I cringe a little bit when I see someone slicing and dicing a theme straight out of the box. You lose the ability to further update functionality in the core theme, and you end up (sometimes completely) rewriting the theme just to make your site work. It’s inelegant, and may lead to problems in the future. But, there’s a better way: Build a child theme, and customize that intead. A child theme is a theme that is based on an already created template set. It takes the functionality, color scheme, options, and code from the parent theme and allows you to make changes without messing with the original code. If you update the parent theme, the child theme will still retain any changes while adding any new functionality straight in — a win-win for everyone! Funny thing: It’s highly underutilized. A survey by Elegant Themes shows that only 35% of people who customize their theme use a child theme when doing so. I think it’s because people don’t understand how. And I’m here to fix that! You can name it ‘themename-child’, or name it something completely different. That’s up to you. Let WordPress know that this theme is a child theme instead of a parent theme. Description: This is a child theme. The ‘template’ line has a link to the folder name of the theme I’m building on top of. That could be ‘standard’, ‘twentytwelve’, or any number of things – it’ll depend on which theme you’re using. That same slug is used below in the @import URL statement. That import statement brings in the current theme’s stylesheet. The only required entries here are Theme Name and Description – everything else is optional (but nice to have). Once you’ve done this, go back to your site and view it. It should look exactly the same – and that’s good! Unless you’ve made any style changes to the theme, nothing will be different – it’s still pulling from the old styles (and your new stylesheet). One thing to keep in mind: any new styles you add need to go under the import statement; the order of operations say that styles further down the file will overwrite ones closer to the top, so any styles you use will over-write the default styles pulled in by the import statement. Want to add something to the header? Make a copy of header.php and insert it into the new folder. Now, WordPress will call that file first, and will call any changes. Any un-changed files can remain in the parent theme directory and will be untouched. There’s two ways to pull information from a theme’s folder using <?php bloginfo(); ?>: ‘stylesheet_directory’ and ‘template_directory’. Using ‘stylesheet_directory’ will pull from the child theme folder, while ‘template_directory’ will pull from the parent theme folder. Make sure to use them accordingly! A few months ago I modified a really cool WordPress template and started using it for my own clients. As part of the overhaul, I realized that there was no really good way (included) to turn a WordPress unordered list into a menu that would work on a mobile device. I tried a few different solutions, but in the end went for the simple one. A selection (drop-down) menu works well, allows for an infinite number of parent and child categories, and is easily done with a simple jQuery script. This should work on most themes with a dynamic menu system. There’s a bit of margin included with the drop downs, but you can adjust as needed. This code is adding classes to the links of the menu. Typically, only the list items have a class attached to them, and this will allow us to differentiate between top level and second level navigation. It also creates the base for the drop-downs (a “select” input) that we’ll soon populate with links. This creates a default option. You can change the “text” value to whatever you want. It becomes the default option. This code searches each list item in the menu container and creates an option in the select box for each. It pulls the link (href), the text, and the class we assigned earlier. Since there’s no form element, selecting the drop-down options by themselves would do nothing. This causes the browser to automatically go to whichever link in the drop-down is selected. The second bit adds a dash to all second level classes – that will allow you to have a differentiates multi-level navigation. This snippit has proven useful time and time again, and even though it’s built for WordPress, it can be adapted to any content management system that uses some sort of a semantic menu structure. I wrote a post a while back detailing how easy it was to add a Login Box to your template. But, it’s even easier, it turns out, to add one to your sidebar. Sidebar Login is a plugin that will let you throw a quick sidebar login box onto your site. And, it’s AJAX compatable, which means that it logs the user in seamlessly and then displays typical “user” account options (profile, logout, etc). Install the plugin and then drag the widget to your sidebar to install it. 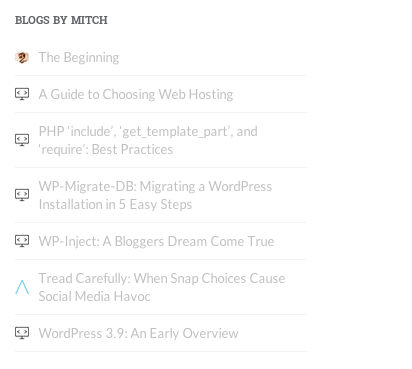 I’ve migrated tons of WordPress sites in my tenure as a WordPress developer, but over the years one thing would always bother me: my widgets kept disappearing. I’d dump the SQL database and import it to the new server only to find that every single widget had vanished. So, I looked for a solution. Unlike a traditional export, you can define ahead of time the destination URL and even the destination file structure (/home/snv/ – not my actual structure, by the way, but a good example). It saves all of the smaller options that are normally left out of an export. You can download it through your blog or through the repository.